All you need to make this quick and easy table runner are 3 fat quarters and then batting and backing measuring 16" x 43"
These are really fun once you get going so I'll bet you will want to make more than one :-) The binding can be made with leftover strips from the fat quarters. 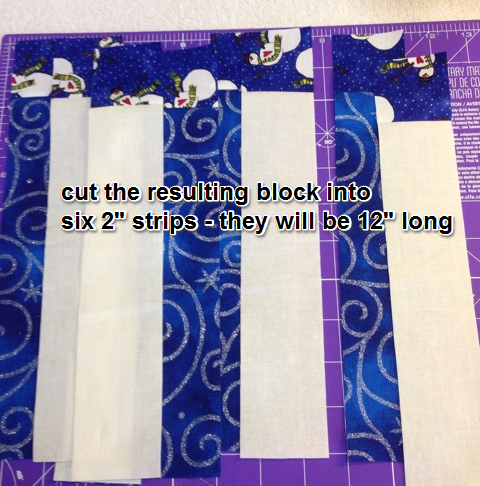 Cut the remainder of the fat quarters into four 2" strips. 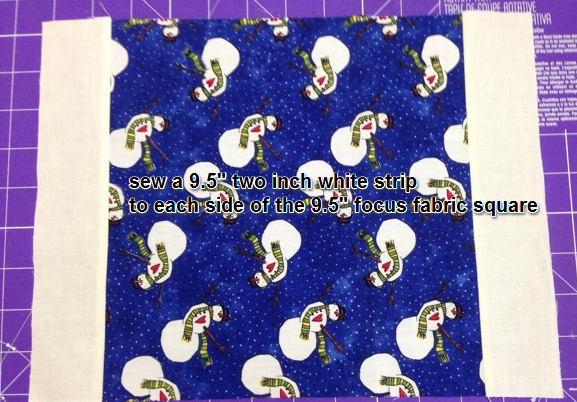 Take two of the 12 inch focus fabric 2 inch strips and sew to each of the white and blue 9-1/2" x 12" strips making a block 11" x 12". Cut those blocks into 2 inch strips as shown on the photo left. 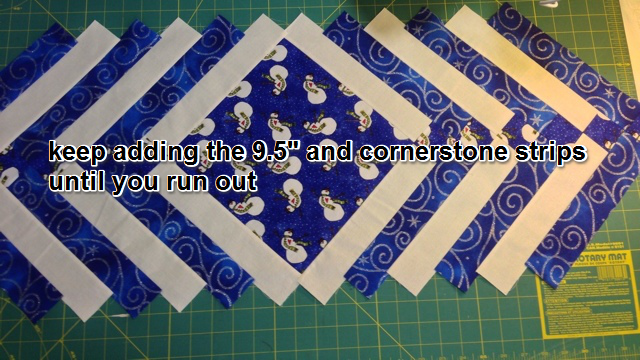 Now start assembling the braid by taking the 9 1/2 inch focus square and sewing a white 9 1/2 inch strip to opposite sides of the focus fabric square. 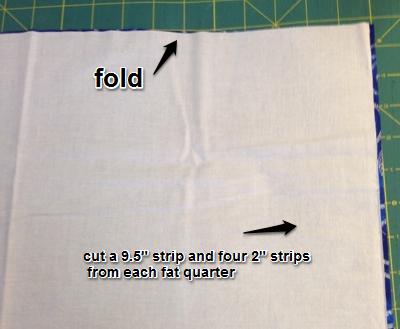 Sew a two part focus and white strip to the other two sides, placing the small square at opposite corners as shown on the left. 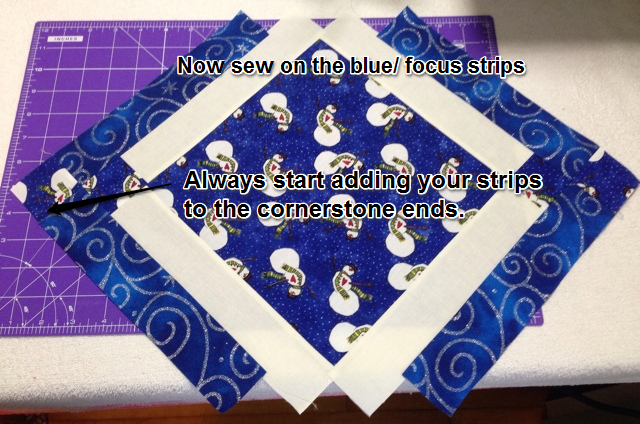 Note that the strip will not go all the way to the end of the block. It feels really odd, but don't worry about it, you are doing okay. 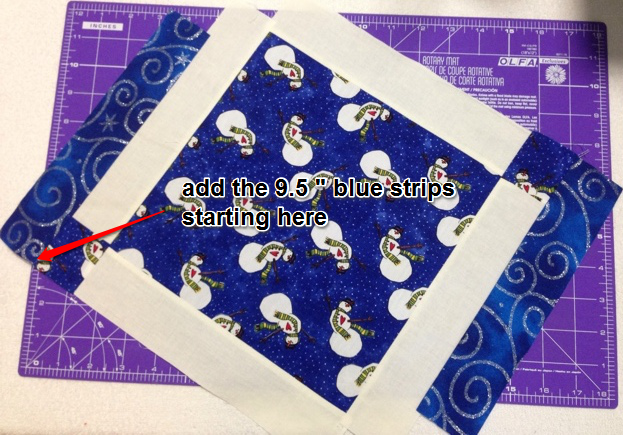 Sew a blue 9-1/2" strip to the two part white strips on both sides of the table runner, starting with the end of the previous strip. Now add a two part blue strip, again starting at the end that has the little square. Keep adding strips, alternating colors and making sure to place the square on the correct corner. Do you see how it is going together almost like a log cabin? After you have sewn all your strips, press carefully. Get all those seams going in one direction on the back so it lays flat. 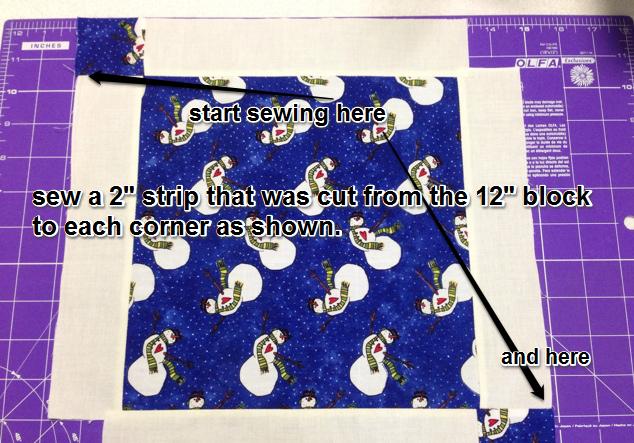 Now place your ruler on the top a quarter of an inch from the corners on the big middle square so that when you trim you don't cut off your points. Line it up and trim off the edges straight. 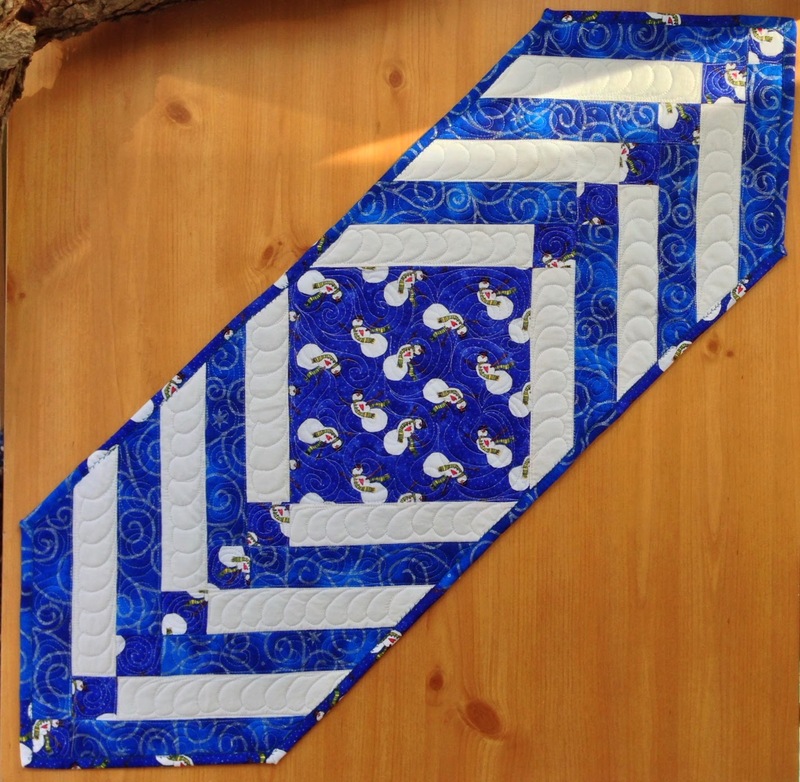 Now quilt :-) Get as fancy or be as simple as you want. You could just stitch in the ditch or practice some fancy feathers or swirls as I have done on the left. All over meandering would also work. 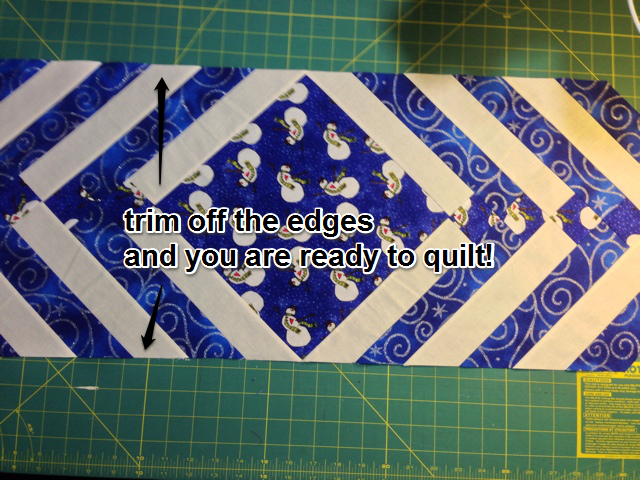 This is a great way to practice your free motion quilting skills. 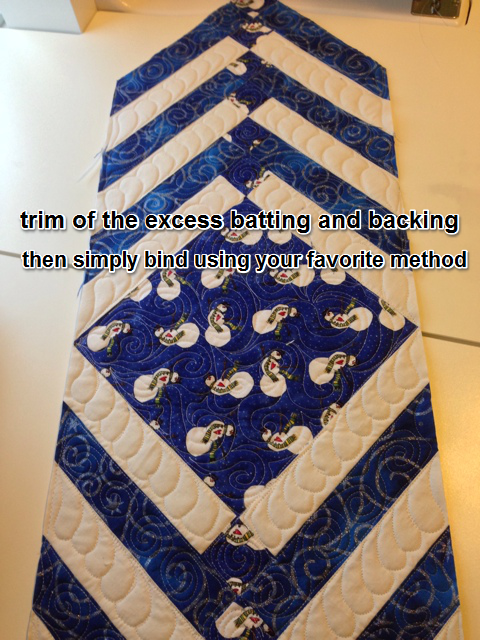 Trim off the excess batting and backing and bind using your favorite method. 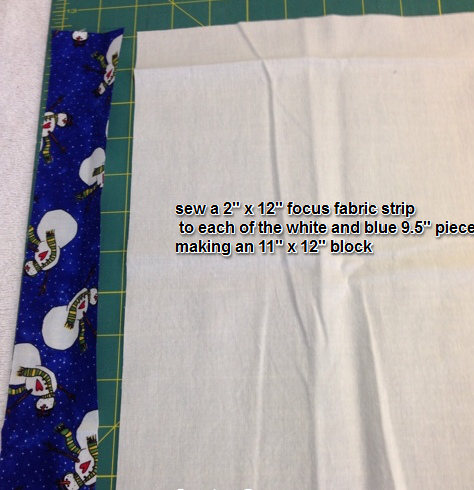 I used the leftover fabric from the focus and blue fat quarters to make my binding. It adds to the scrappy feel. 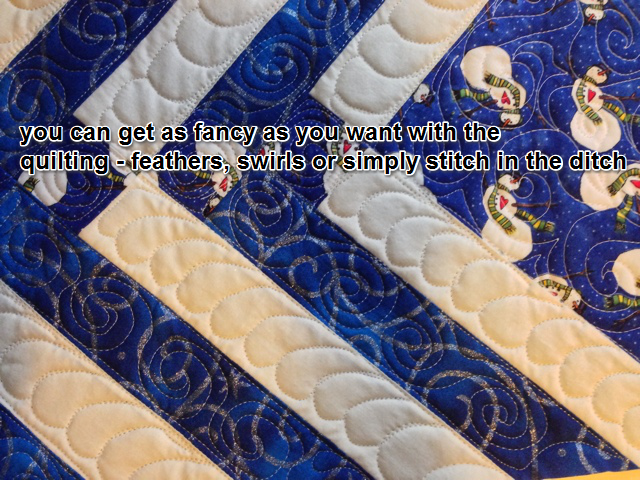 This pattern was originally posted on the quilt bug website as a free to share pattern. It was for a fund raiser for cystic fybrosis. If you would like to donate to the cause, the original post is here.